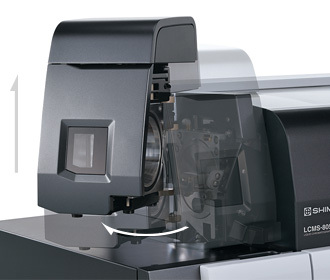 Shimadzu's MS interface includes a high-sensitivity heated ESI source, heated capillary sample introduction, and proprietary ion transfer optics. These design features combine to produce robust MS performance. 12,000 plasma samples were injected over 25 days (over 480 samples per day). Picogram levels of alprazolam were analyzed with an RSD of 3.42%. IDL is one measure of sensitivity for analytical instrumentation. The chromatograms below show the IDL for Reserpine and Chloramphenicol, obtained using ESI+ and ESI-, respectively. The IDL for Reserpine is 2.03 femtograms and 2.09 femtograms for Chloramphenicol. 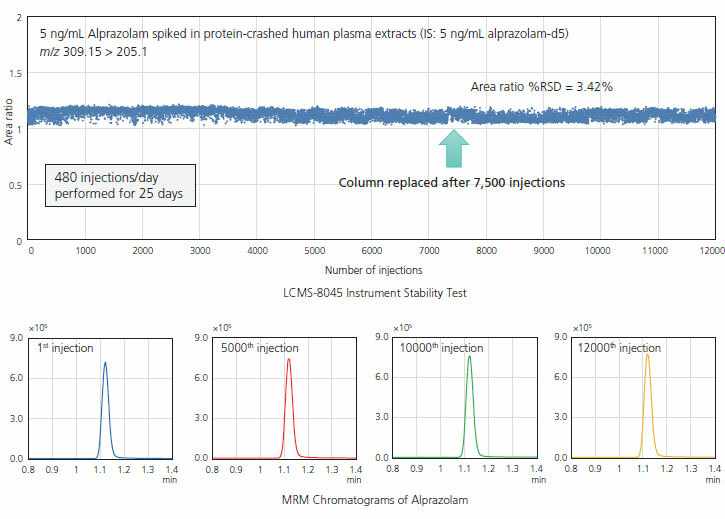 As with Shimadzu's other triple quad systems, maintaining the LCMS-8045 is simple. Replacing the desolvation line (DL) and ESI capillary is quick and easy. Additionally, the design allows users to replace the DL without breaking vacuum, providing greater uptime and usability.